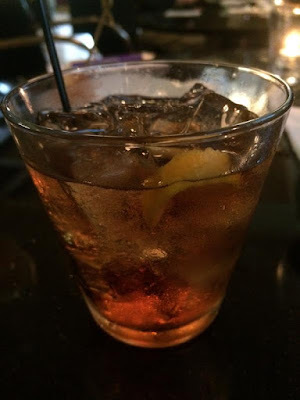 Last week, I discussed The Most Ignored Wine:Vermouth. It's a wine that many wine lovers don't seem to write about, and some might not even realize that it is a wine. Vermouth can be delicious and complex, intriguing and diverse. We 're fortunate in the Boston area that some restaurants understand the wonders of Vermouth and showcase it on their menus. Let me bring your attention to two examples, to give you a glimpse into what you can find. I recently attended a media dinner at the new Papa Razzi Metro in Burlington, which has undergone a radical renovation, from its interior to its menus. One of their most interesting cocktails on their list is the Tempo Triplo ($11), a blend of three Vermouths with some bitters (pictured above). Unlike many other cocktails, where Vermouth is almost an afterthought, this is a cocktail where Vermouth takes place front and center. It is a love letter to Vermouth, a concoction that displays the full wonders of Vermouth. The three Vermouths are all from Contratto, an Italian producer who has been making Vermouth since the 1890s. The cocktail is a,blend of their Bianco, Rosso, and Americano Rosso, and I also got the opportunity to taste each on their own. The Bianco was more herbal in nature with only a hint of sweet, while the Rosso was sweeter, with the herbal notes more in the background. The Americano was more savory in nature. In the Tempo Triplo, equal amounts of these three Vermouths are mixed together and then topped with some Orange Bitters. I found the cocktail to be delicious, an intriguing blend that was lightly sweet, with plenty of herbal notes and a slight bitter edge to the finish. It was refreshing and interesting, a fine drink for the summer, and one which would pair well with food too, such as a spicy sausage pizza or a cheese plate. Vermouth can shine as the dominant ingredient in a cocktail. I've previously wrote about the Summer Rosé Tour at Bistro du Midi, their summer-long specials showcasing Rosé wine. Last week, I spoke with Head Sommelier Todd Lipman who told me about another Rosé special they recently added, their House-Made Rosé Vermouth. You can choose to order a glass on its own ($9) or in a Rosé Negroni ($15). I'm sure they would be willing to use in other cocktails if you asked. The House-Made Rosé Vermouth.starts with an unaged Grappa, fresh strawberries and dried cranberries, which are macerated for about three days. The solids are then removed, and they won't be tossed away but will be used in dishes like their foie gras. A dry Rosé and a Ruby Port are then added. Herbs and botanicals are steeped, including wormwood, gentian, bitter orange peel, dried oregano, thyme, sage,fresh rosemary,juniper berries and vanilla bean, All of this is eventually warmed and then finished with a fine, dry Rosé. It is obviously a laborious process, a labor of love, which highlights the marvels of finely crafted Vermouth. I tasted the Rosé Vermouth and was impressed. Initially, the lightly sweet vermouth presents with bright red fruit up front, tasty strawberry and raspberry flavors, and then the herbal notes come forth, complementing the fruit, adding savory elements. On the finish, there is a tinge of bitterness, a satisfying ending to the roller-coaster of flavors within the vermouth. This too would pair well with certain foods, and I'm sure Todd can steer you to some intriguing pairings. Which other restaurants either make their own Vermouth, or makes a tasty Vermouth cocktail? It's probably not about foreign Sake breweries. Two weeks ago, I wrote about Japanese efforts to legally define and protect "Japanese Sake." Legal protection apparently will be sought from the World Trade Organization (WTO), and the initial definition, which is still subject to change, indicates that "only sake made in Japan using domestically grown rice be sold as “Japanese sake.” Such efforts to protect "Japanese Sake" are akin to previous efforts to protect items like Champagne and Sherry, efforts I support. However, I was curious as to why Japan decided to just now seek legal protection for Sake. What was the impetus for their decision? Were they concerned about the couple dozen of foreign Sake breweries which have arisen around the world, from the U.S. to Norway? None of the news articles seemed to indicate a rationale for Japan's actions. I might now have an answer. An article I read yesterday in the Financial Times may just offer that rationale. You've probably heard about the Trans-Pacific Partnership (TPP), a "free trade" agreement among 12 countries, including the U.S. President Obama has been trying to get approval for this controversail agreement, and has run into some opposition, especially from Democrats. It is also an agreement which has garnered plenty of attention in Japan, and I wrote a couple years ago how it could lead to lessened or eliminated Sake tariffs. If TPP passes, it could lead to a significant reduction in Japan’s heavy tax on imported rice, currently about $1.30 per pound. Discussions on rice imports and tariff reductions have occupied plenty of negotiations between the U.S. and Japan. If the taxes on imported rice are drastically reduced, it could mean that some Japanese Sake producers might decide to purchase the less expensive rice from the U.S. rather than use more expensive domestic rice. The Sake industry may see such a scenario as a threat to their traditional product. Would Japanese Sake breweries actually use U.S. rice? Consider that about 75% of all Sake is called futsu-shu, regular Sake which often is made from table rice, and not the more expensive Sake rice. Futsu-shu often is inexpensive and some producers try to make it as cheaply as possible. If they had access to cheap U.S. rice, cheaper than domestic rice, there probably is a good chance they would do so to save expenses. It seems logical then that the Sake industry would want to protect itself from this eventually, If they require "Japanese Sake" to use domestically grown rice, that would probably stop most Sake breweries from considering using U.S. grown rice, no matter how inexpensive. The threat to the integrity and reputation of Japanese Sake is not from foreign breweries. It is more from the possibility of Japanese brewers no longer using Japanese rice. Rant: A Rushed Tasting Menu? The documentary Jiro Dreams of Sushi has received many, well-deserved raves and garnered great fame for sushi chef Jiro Ono, the owner of Sukiyabashi Jiro, a 10-seat, sushi-only restaurant in Tokyo that has earned three Michelin stars. At this restaurant, for about $300, you'll receive a tasting menu of approximately 20 courses. Reservations must be made at least a month in advance, and they have no shortage of customers willing to pay for the experience. One common criticism about the restaurant is that the meal seems rushed, that you finish your meal in only about thirty minutes. The criticism has some validity, though the shortened dining period is intentional, and based on a few different reasons. In the U.S., such multi-course meals are usually extended over of the course of two to three hours, if not longer. When you pay such a high amount for your dinner, many expect to enjoy a leisurely meal, making it a lingering experience. They want to slowly savor each course, to appreciate all that the chef invested in each dish. When they are paying such a high amount of money, they want to derive value and perceive value to include a lengthened dining experience. If a local restaurant tried to push its diners to finish a large tasting menu in half an hour, there might be a revolt. Reviewers would probably scold and penalize such a spot, complaining the unnecessary rush. On places like Yelp, such a restaurant would get plenty of One Star reviews. However, can such a "rushed" tasting menu be justified in any manner? One of the primary reasons why a meal at Sukiyabashi Jiro is compacted into a short time period is based on science. It takes the human body about twenty minutes to become satiated after eating. The longer you continue to eat, the more and more full you will feel, and the less and less you will appreciate the later courses you eat. If you consume your entire meal in about thirty minutes, then you are more likely to appreciate and enjoy each and every course. Chef Ono wants every course to receive the full attention of his customers. Think about those lengthy tasting menus you have experienced, and try to remember how you felt during the later courses. I'm dined with a number of people who have spoke of being full, but who still continued on, finishing the last few courses, but really not enjoying them to their fullest. This provides support to Chef Ono's thoughts, and maybe other restaurants should pay heed. Maybe tasting menu meals in U.S. restaurant should be eaten quicker than the usual time periods. We might not have to cut them down to thirty minutes, but cuts might be justified. There would be a trade-off involved, a lessened "experience" but with a reward of a greater enjoyment of your food. How much do you value the experience of a lengthy tasting menu, knowing that you probably won''t properly enjoy the later courses of your dinner? How important is it to you to experience the food at its optimal condition? Would you still be willing to pay the same amount for a tasting menu that occurs during a much shorter time period? I doubt we're going to start seeing a growing trend of 30 minute tasting menus in the U.S. anytime soon. However, restaurants might want to start trying to reduce the amount of time of their tasting menus, paying consideration to the amount of time it takes their customers to start feeling full. Back in December 2011, I started a blog column, Authors, Alcohol & Accolades, which asked some of my favorite authors about their preferred drinks, both alcoholic and nonalcoholic. There have been 11 editions of this column so far, with more coming in the near future. The inspiration for this series is that I am a voracious reader, of both fiction and nonfiction, and I wanted to combine that interest with my love of food & drink. The series has proven popular and it has been fascinating to explore what authors enjoy drinking. As a special addendum to that series, I've previously posted lists of my Favorite Fiction Books of the Year, such as last years Favorite Fiction Books of 2014. I am going to post a similar list, of some of my favorite fiction books of the first six months of 2015. During this time period, I have read over 130 books. Though there are still a few more days in June, I won't be reading any more fiction as I am immersed in a couple non-fiction books which will take me to the end of the month, As I mentioned, I am a voracious reader, and expect to read about the same amount during the rest of the year. The following lists of favorites will include books of Science Fiction, Fantasy, Horror and Mystery/Thrillers. Though nearly all of these books were published in 2015, there might be a few that weren't, but I first read them in 2015. The books are also not in any specific order of preference. It was hard enough to break the list down as I did without trying to rank it from #1 to #10. As a special addition this time, I'm also offering some drink pairings for each work, selections which I think are fitting for various reasons. Hope you enjoy. There five books almost made the above list, but I had to make some tough cuts. However, they are still more than worthy of my recommendation. What do you think of the Drink pairings? Would you choose a different Drink for any of these books? I am very interested to see which of these books will still be in my Top Ten at the end of the year. I already know there are some potentially excellent books due out during the next six months so there will be serious challengers to those currently on these lists. All of these books would make great summer reading and a number of these authors have also written other worthy books. Please support an author, a small, independent business person, and buy more books. 1) On Monday, June 2, at 6:30pm, Terramia Ristorante, located on Salem Street in the North End, is celebrating the long standing history of Frescobaldi wines with a five-course Tuscan wine dinner. The Frescobaldi family has over 700 years of winemakers dedicated to serving the highest quality Tuscan wines. Established in 1300, their faithful clients have included everyone from great Renaissance artists to the Papal and English Courts. Centuries later they were the first in Tuscany to plant Cabernet Sauvignon, Merlot, Pinot Nero and Chardonnay, and to this day they continue to change the wine industry. At this Frescobaldi dinner, will sample Chef Luiz Prata’s hand-crafted five course menu paired with Frescobaldi’s Tuscan wines. The meal will start with Tonno Crudo, a sushi grada tuna tartare with cherry tomatoes, avocado, and micro greens salad matched with a 2013 Frescobaldi Pomino Bianco Chardonnay. The second course follows with Torta, smoked tomato and braised onion tart topped with goat cheese and mâche greens alongside a 2011 Frescobaldi Nipozzano Chianti Rufina Riserva. As the night continues, guests are treated to spinach and feta filled Ravioli Amatriciana with smoked pancetta, spicy Collina tomato sauce, pecorino and parigiano, paired with a 2011 Tenuta di Frescobaldi. The fourth course includes the Bistecca, a prime filet mignon complete with sweet potato mash, sautéed baby spinach and red wine reduction complimented by a 2008 Frescobaldi Castel Giocondo Brunello di Montalcino. The evening will finish on a sweet note, a Budino Di Pane, salted caramel bread pudding with vanilla gelato, is enjoyed with a 2006 Frescobaldi Pomino Vin Santo. Ciro Pirone, Director of Italian Wines at Horizon Beverage Company will be on hand to discuss the nuances and history behind each and every wine. 2) Last summer, Fruit Center debuted an outdoor grilling series  offering free lunch for its customers -- with a unique twist: manning the grill in the supermarkets parking lot were recognizable chefs from South Shore restaurants, rolling up their white-jacketed sleeves to serve up mini-samples of recipes lifted from their own impressive menus, but made with meats, seafood and produce given to them by Fruit Center. A repeat of the outdoor grilling series for summer 2015 was a no-brainer. The chefs that'll appear at Milton Marketplace and the Hingham Harbor location are a mix of both familiar and emerging culinary personalities. Grilling demonstrations at Fruit Center are free of charge and lunch items will vary. Look for the big white tent and the smoking grill in Fruit Center parking lots on the following dates between 11:30 am and 1pm. 3) To complement its nearly 120 whiskey selections, Saloon in Somerville’s Davis Square is debuting a new menu to satisfy the palates (and stomachs) of the brown liquor faithful. Designed by Executive Chef Shayne Nunes, this pre-Prohibition restaurant and bar’s refreshed and expanded menu focuses on shareable, savory cuisine to pair with its extensive roster of alternative whiskey and scotch selections creating the ultimate social experience. To start, there are over a dozen hors d’oeuvres to choose from. To showcase the season’s bounty, Chef Nunes serves up Saloon Street Corn (two grilled cobs, spicy remoulade, cotija cheese, grilled lime - $7); Watermelon & Watercress Salad (feta, granola, fig-balsamic vinaigrette - $9); and, Local Heirloom Tomato Salad (beefsteak tomatoes, fresh mozzarella, pistachio-basil ricotta, reduced balsamic - $12). For heartier whiskey-friendly bites, there is Grilled Bratwurst (tomatillo relish, smoked honey mustard, brioche finger roll - $6); Baby Back Ribs (whiskey BBQ, peach-purple cabbage slaw - $10); Picatta Chicken Wings (roasted garlic, capers, parmesan, lemon-butter sauce, fresh herbs - $8); and, Crispy Potato Wedges (garlic, parmesan, pork belly, horseradish mayo - $7). For turophiles balancing the art of spirits and cheese, there is an Artisan Cheese Board (selection of three cheeses with assorted fruits - $13) and meat-lovers can sharpen their appreciations with the Charcuterie Board (selection of three cured meats with mustard and toast - $14). Saloon also will continue to serve up its signature Devils on Horseback (feta-stuffed dates wrapped in bacon - $9), inspired by a taste in history when the Norsemen invaded England and wore rashers of bacon as armor while on horseback. For entrees, there are five options that come enveloped in refined succulence and are a perfect complement to your malt of choice including the Tenderloin Steak Tips (bourbon marinade, roasted garlic-potato purée, red watercress salad, crispy shallot, picked red onion - $24); Pan-Roasted Atlantic Swordfish (creole potato salad, grilled peaches, golden peach BBQ - $24); Arline Chicken Breast (fig and chorizo stuffed, smoked Gouda polenta, baby kale, lemon-butter sauce - $20); Grilled Stuffed Avocado (red quinoa-charred corn salad, heirloom cherry tomatoes, pistachio-ricotta, farm egg, sriracha - $15); and, the Rodeo Burger (USDA prime, Great Hill blue cheese, crispy onion strings, whiskey BBQ, garlic parmesan fries, brioche bun - $15). 4) Are you ready to rumble? On July 1, at 5:30pm, Puritan & Company is hosting a Rosé Rumble in the next installation of “Wine Wednesdays.” Puritan & Co. Chef/Owner Will Gilson, Chef de Cuisine Alex Saenz, Wine Director Peter Nelson and the restaurant’s team are featuring 15 different varieties of Rosé paired with small bites. Guests are invited to say “Yes Way, Rosé!” where they can mix, mingle and sample at this celebration of the pink-hued wines. Passed appetizers and small plates will be paired with a selection of 15 rosé wines to make this event a little more special than most. After a hiatus, the Stoneham Farmers Market has been resurrected and opened last week. I checked out the first market and look forward to returning again, to revisit some of the vendors and see what other new vendors begin showcasing their products. The Market is open every Thursday, from 2:30pm-6:30pm, on the Town Common and will take place into mid-October. There is plenty of parking in the area, making it easy to stop by the Market. In the middle of the Common is the main Market booth, where you can obtain additional information, check the calendar of upcoming events, enter a raffle, and more. This sign provides a calendar of upcoming events at the Market, from entertainment to artisans. There was a community booth with the Stoneham Alliance Against Violence, whose mission is: "To raise community awareness of domestic violence, and to promote programs that work to reduce violence and encourage healthy relationships." It is good to see the Market helping to promote such important community issues. Obviously, at a Farmers Market, you hope to get some fresh and delicious produce and there were three vendors at last week's market. During the next few months, you will see a number of different produce vendors, including Kelly's Farm, Sugar River Farm, Arrowhead Farm, and Lanni Orchards. Some of these farms sell organic produce. Everything I saw looked very fresh, and the items I eventually purchased, from tomatoes to Romaine were tasty. Some of the produce may be more expensive than you find at the local, chain grocery stores, but I believe it is worth the extra cost. It is local and fresh, and some of the produce you get at the grocery stories might come from anywhere in the world. You get to support a local farm, a small business, rather than a huge corporation. The organic produce can be more expensive but it is just as pricey as organic produce at the chain grocery stores. I also think the local produce tastes better than much you might find at the chain grocery stores. Red Fire Farm was also at last weeek's market. Based in Somerville, Deano's Pasta produces a variety of pasta, from fresh egg fusilli to ravioli. You can also purchase theit sauces, such as marinara or cream sauce. Their menu is likely to change each week, offering different items all the time. There were several baked goods vendors at the Market. Top Shelf Cookies, which bakes its cookies in Dorchester, offered about five different types this week, and it seems they will offer some different choices in the future. From Chocolate Chip to Green Monster Mint, the cookies cost $3 for a pack of 2 and $7 for a pack of 6. I sampled some of the cookies and they were soft and fresh, with very nice flavors. Top notch products. I especially liked Alex's Sweet Heat, a chocolate cookie made with hot sauce which gave it a pleasant, spicy finish. I'll be back to buy more of their cookies. Jennifer Lee's Bakery offers cookies, breads, cupcakes and more. I bought one of the corn breads and it was good, especially watm, slathered in butter and accompanying some pulled pork. Two other bakers who were at the Market last week include Swiss Bakers and Mad Cake Genius. Swiss Bakers is one of my favorite bakeries, and they always have lots of delicious Swiss treats, from preztel breads to berliners, linzers to weggli. Mad Cake Genius now has a store in Melrose and they produce Finnegans, those small, cinnamon puff pastries which once were made by Hank's Bakery. That alone is reason to check them out. Roberto's Seafood offers about a dozen types of frozen seafood, such as Haddock ($9 lb) and Tuna ($9 lb). I didn't buy anything from them last week but plan to do so soon. Local seafood is a great choice and the prices seem reasonable. As I often say, people need to eat more seafood so it was great to see such a vendor at the Market. Besides all the food, last week there was a booth selling paintings and prints. There was also Wicked Good Soap Company,, which makes bath and beauty products, including goats milk soap. It is great to see the Stoneham Farmers Market back again, and I hope you check it out to buy some fresh produce, baked goods, seafood and more. I'll be returning there and if I find anything particularly special, I will be sure to let you know. I am hoping the Market will have a meat vendor in the near future. It's a wine with a fascinating history that extends back thousands of years. It's currently produced in France, Italy, Spain, Australia, Germany, the U.S. and more. It's seeing a renaissance in the U.S., an explosion of producers in the past six years. It can be delicious and complex, intriguing and diverse, and offers a template upon which a producer can put their individual stamp. However, if you search for this wine on most wine blogs, you'll rarely find any reviews. It's a wine that gets far more attention from cocktail lovers than it does wine lovers. Many people probably do not even realize that it actually is a wine. They might see it more as a liqueur or spirit. This is all something that needs to change. The wine in question is Vermouth, a fortified and aromatized wine. Why is it so ignored by wine lovers? Is it because it is a "flavored" wine? Though craft beer lovers often embrace flavored beers, many wine lovers show disdain for flavored wines. They seem to think wines should remain relatively pure, with flavor from grapes and oak, but nothing else, despite the fact wines have been flavored for thousands of years. Sure, there are flavored wines which aren't done well, and taste artificial and unpleasant. However, a carefully crafted Vermouth can express an amazing melange of harmonious flavors. Is it because it is seen more as a cocktail ingredient than a beverage of its own? Yes, it often is used in modern cocktails, and you are unlikely to find it on most restaurant wine lists. However, back in the later half of the 19th century, when Vermouth first started appearing in cocktail recipe books, one of the most popular was the Vermouth Cocktail, which only contained Vermouth, a piece of ice and a lemon peel. The flavor of the Vermouth, basically on its own, was paramount . In Europe, it is still common to drink Vermouth on its own. It is in the U.S. where people have been slow to embrace this wine on its own. Is it due to a lack of understanding about Vermouth? Do you realize it is a wine? Do you realize the diversity of Vermouth? It is no longer as simple as dividing Vermouth into sweet and dry. Were you aware of the various U.S. producers of Vermouth, from California to New York? When is the last time you enjoyed Vermouth on its own, and not in a Manhattan or Martini? Back in 2010, I reviewed my first Vermouths, from two different U.S.producers, including Quady Winery and Sutton Cellars. The Sutton Cellars Brown Label Dry Vermouth even made my Top Ten Wines of 2010 lists. Since then, I've probably reviewed about ten other Vermouths, with two of them ending up on later Top Ten Wine lists, including the Atsby Armadillo Cake Vermouth and Vermut LaCuesta. I've experienced the delights of Vermouth and hope others will widen their vinous horizons and experience it as well. Vermouth is definitely worthy of much more attention than it receives from wine lovers. People need to learn more about it, and taste the various examples that are available. Wine bloggers need to write more about it, to share knowledge of Vermouth with their readers. The U.S. needs to take a more European approach, and learn to appreciate Vermouth on its own, and not just as a cocktail ingredients. What are your thoughts on Vermouth? "...it was a drink to have with people you feel connected to." It may be one of the most ignored wines, often seen more as a minor cocktail ingredient. However, this wine, Vermouth, is a fascinating beverage, with a rich history, and modern producers, including a number in the U.S., are producing Vermouths of quality and complexity, worthy of consumption on their own. There is a definite need for education about Vermouth, for someone to tell its story,and Adam Ford has written a book which well serves that purpose. Published earlier this month, Vermouth: The Revival of the Spirit that Created America's Cocktail Culture by Adam Ford (Countryman Press), is available as a hardcover of 240 pages ($24.95),or an E-book ($11.99). In 2012, Adam Ford founded Atsby Vermouth in New York and now produces two Vermouths, the Amberthorn and Armadillo Cake. Each Vermouth has its own secret blend of botanicals, presenting intriguing and complex flavors. Adam is a passionate advocate for Vermouth, frequently speaking and educating others about this unique wine. "I wrote this book because I fell deeply in love with a delicious aromatized wine while walking through the Italian Alps." Ford's new book is broken down into four chapters: The History of Vermouth, Vermouth in America, American Vermouth Today, and Vermouth Cocktails. Throughout the book are plenty of colorful photos and a few sidebars on vermouth-related topics. "..the story of vermouth is the story of the silk routes." The History of Vermouth begins in China, about 7-8 thousand years ago, with wine enhanced with botanicals. This might be the earliest prototype of Vermouth. Plenty of other ancient cultures drank similar wines mixed with botanicals, from Egypt to Rome, Ford presents a fascinating historical tale which proceeds to the Middle Ages, and beyond, noting how spices and herbs became seen as medicinal, and wines created with such ingredients were seen as healing elixirs. There is a discussion of wormwood, and the wines that were created using it, as well as information on Antonio Carpano, often seen as the inventor, or at least the popularizer, of modern Vermouth. This chapter is an excellent way to understand the origins of Vermouth, providing lots of historical tidbits to tantalize your brain. "For the past 150 years, vermouth has shaped cocktail culture in the United States more than any other spirit." 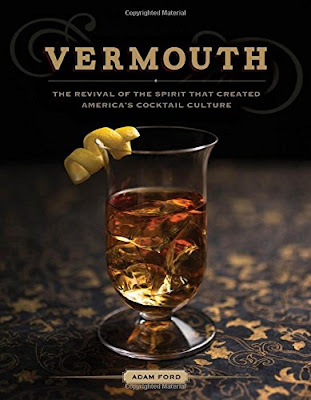 Vermouth in America continues the historical narrative, concentrating its appearance in the U.S., especially in New York during the 19th century. Again, Ford presents compelling facts about the early history of Vermouth, and how it became an important element of the new cocktail culture. At that time, Vermouth was both drank straight and in cocktails, often being the primary ingredient. By the 1890s, some New Yorkers tried producing their own Vermouth, as did others from Ohio to California, though none acquired commercial success. The chapter continues detailing Vermouth's history in the U.S. into the 20th century, from Prohibition and beyond. You'll certainly leave plenty about Vermouth's presence in our history in this chapter. "Today, however, American producers are making vermouths that taste nothing like one another, and nothing like their European counterparts." American Vermouth Today details a number of American Vermouth producers, including Quady Winery, Sutton Cellars, Imbue Cellars,Atsby Vermouth, and Uncouth Vermouth. Each profile presents a short history of the producer, info on their Vermouths, and a cocktail recipe. This chapter will help you learn about some American Vermouths, to get a glimpse of the future as more Vermouth producers are popping up all the time. There are also a couple fascinating sidebars in this chapter on whether American Vermouth is actually Vermouth or not, as they generally don't include wormwood as an ingredient. Learning about the burgeoning Vermouth scene will be eye-opening to many who were unaware of these producers until now. "The secret to using quality vermouth in a cocktail is to use more vermouth than spirit; otherwise you risk washing all the nuanced flavors away with the heavier-proof spirit." The final chapter, Vermouth Cocktails, presents 23 Vermouth cocktails, divided into Brunch, Apertif, Modern and Late-Night categories. You can also find another 16 cocktails throughout the rest of the book. Probably the majority of recipes call for Atsby vermouths, though the others reference other Vermouths or are more generic. You'll find classic cocktails like the Manhattan to more inventive ones like the Hanky Panky. These are cocktails intended to showcase Vermouth as the main ingredient. "The most important thing for American vermouth producers going forward is to protect vermouth from the axes that hack. In other words, never let vermouth revert back to a mass-produce, undifferentiated, industrial product made for mixing." Overall, this is a fun, informative and fascinating book about Vermouth, filling a gap and helping to educate wine and cocktail lovers about this intriguing wine. This book is well written and appears to be very well researched too, It helps to clarify common misconceptions about Vermouth, presenting information you probably won't find elsewhere. I would have liked to see some information on Vermouth and food pairings. There is a brief mention of classes and dinners with such pairings, but there isn't any practical information provided. I highly recommend this book, hoping more people gain an appreciation for this unique wine. What is the optimal size for a restaurant menu? Can there be so many options on a menu that it overwhelms the diner? Can a menu be too short, with too few options? Do the answers vary due to restaurant size, cuisine, price, or other such matters? Last week, I dined at a local Italian restaurant and spoke with the general manager, who mentioned that a few customers had complained that their menu was too small, with insufficient options. Their lunch menu has about 25 options, from salads to pasta, sandwiches to pizza,and their dinner menu has roughly 30 options, with entrees replacing the sandwiches. I don't consider that a small menu, unless you compare it to some chain Italian restaurants that seem to have a dozen menu pages of dishes. At this particular restaurant, I have difficulty deciding what to order because so many of their dishes sound so delicious. I generally prefer smaller restaurant menus, with exceptions, for multiple reasons. First, a large menu, with many dozens of choices, presents far too many choices, a sensory overload which stifles choices many that it helps. Second, a restaurant with a small menu should be able to produce better quality food through specialization. They wouldn't have to cook and prepare such a large list of dishes, increasing the chance for mistakes. Third, a restaurant with a smaller menu will often have fresher ingredients, as there is more turn over. With a large menu, some dishes might not be ordered that much, and maybe the ingredients for such matters aren't as fresh as they should be. Otherwise, the restaurant would have far more waste. A restaurant doesn't need to be everything for everyone. That is the problem with some chain restaurants, as they try to create a large menu to appeal to everyone's preferences. By doing so, they can fail to achieve the level of quality they could achieve with a much smaller menu. Yes,if a restaurant has a smaller menu, they won't be able to cater to everyone's specific tastes. That is the trade-off. And I think the best of those restaurant have made an excellent decision. When I think of my favorite restaurants, the vast majority of them have small menus, well-honed selections which express quality and taste. I always find multiple dishes that appeal to me and I'm very satisfied at the end of my meal. Do you prefer that a restaurant have a smaller or larger menu? 1) Tempo, on Moody Street in Waltham, brings fresh flavors to Thursday nights with the launch of its Taco Thursday. Every Thursday, Tempo will offer a choice of three delicious taco options created by Chef-Owner Nathan Sigel. Served with two tacos per order and priced at only $10, the taco additions to Tempo’s menu provide the perfect way to start your meal. Diners can choose from signature tacos such as the All Natural Beef Brisket Tacos, Blackened Cajun Haddock Tacos, Shrimp and Chorizo Tacos, as well as a selection of unique taco creations, including the Venison Chili Tacos (crushed peanuts, caramelized corn crema, spiced blackberry port glaze), Yellowfin Tuna Tataki Tacos (pineapple-tomatillo salsa, avocado mousse, passionfruit aji), and Korean BBQ Duck Tacos (duck confit, spicy cucumber and radish salsa, crispy shallots, ginger-lime vinaigrette). 2) On Sunday, July 26, at 6pm, Chef Paul Turano of Tryst Restaurant in Arlington, is collaborating with New England’s very own root beer company, Tower Root Beer, for the fifth annual Root Beer Dinner, celebrating Tower’s 100-year-old classic soda recipe. Founded in Somerville, in 1914, Tower Root Beer evolved from a tonic company into a specialized root beer company. During the Prohibition of the 1920’s when root beer became the substitute for beer that was no longer available, their pharmacist perfected recipe contributed to Tower’s early success and allowed them to withstand the stock market crash of 1929, even when the bank that held their working capital could not. Spanning New England, Tower Root Beer grew into a well-known business before an unsuccessful merger and competition from the two major soda conglomerates forced them off the market. Over 30 years, Tower’s recipe sat under lock and key, before a third generation of the family decided to reestablish the family business after finding their grandfather's handwritten recipe. Finally back, Tryst Restaurant is celebrating the return of the timeless drink with a classic three course, prix fixe dinner by Chef Paul Turano featuring root beer inspired dishes and innovative cocktails inspired by the sweet treat. Reservations are required and can be made by calling Tryst at 781-641-2227. 3) A Wild Affair is a 21+ “tasting” event that will feature stations hosted by Greater Boston’s best restaurants and caterers as well as live entertainment, a silent auction, and an opportunity to stroll among the animals. 2015’s A Wild Affair is generously sponsored by Stoneham Bank and Weiss Farm. Participating restaurants include Buffalo Wild Wings, Burton’s Grill, Edible Arrangements, Fuji at Assembly, Harrows Chicken Pies, Seasons 52, Woodman’s of Essex and many others. Proceeds from A Wild Affair will support the operation and continued growth of Stone Zoo, its education programs and conservation initiatives. WHEN: June 20, 2015 5:30 – 9:30 p.m.
TICKETS: For ticket information, visit www.stonezoo.org. The wines of Uruguay have started to make their mark in the U.S., and deservedly so, and their popularity will only continue to grow as their presence expands in the market. Last September, I attended a large Uruguayan trade tasting, and was thoroughly impressed with what I tasted. Check out my prior articles on the Wines of Uruguay: Part 1, Part 2, and Part 3. These articles cover everything from history to tasting notes, grapes to wineries, giving you an intriguing glimpse into Uruguay. Recently, there was another major Uruguayan trade tasting event, and I had the opportunity to learn even more about their wines. Prior to this event, I attended a media lunch at the Capital Grille with Gilles de Chambure, MS, who does some work for the Wines Of Uruguay. He wanted to share with me some information and wines from Bodega Garzón. Alejandro Bulgheroni, an Argentinian, got his start working in the energy sector, including a number of agro-industrial projects. Around 1999, Alejandro and his wife, Bettina, came to Garzón and were enamored with the land, eventually deciding to purchase 2200 hectares of land and 2000 hectares of forest. They first planted olive trees to produce olive oil, and almond trees, because Bettina wanted them. Today, they grow 14 types of olives, almonds, blueberries and pecans. Alejandro eventually decided he also wanted to grow vineyards and produce wine, so he hired Alberto Antonini, an enologist from Tuscany, to make that desire a reality. In 2007, Antonini started to examine the region, checking its soils and terroir, trying to ascertain what might grow best. In 2008, the first vines began to be planted. Bodega Garzón is located in the eastern border of the Maldonado region, about 11 miles from the Atlantic Ocean. It is one of the only wineries in this region, though others have started showing interest in expanding into the area. Currently, the bodega owns about 500 acres of vineyards, broken down into 1000 different lots. They grow grapes including Tannat, Merlot, Cabrnet Franc, Pinot Noir, Marselan, Caladoc, Albarino, Sauvignon Blanc, Pinot Grigio, Viognier, and Petit Manseng. Despite that diversity, about 80% of their vineyards are planted with Tannat, the signature grape of Uruguay. Their latest project is the construction of a new, state-of-the-art winery which will be LEED Certified (Leadership in Energy & Environmental Design), and that will make them the first sustainable winery outside the U.S. with that certification. Bodega Garzón is passionate about sustainability and plan to open the new winery by December. About 25 hectares of their vineyards are organic and their goal is to eventually become 100% organic. The 2015 harvest is considered to be an exceptional vintage so you should look forward to those Uruguayan wines in the near future. One of the factors that makes Uruguay, which has 410 miles of coastline, unique in the wine producing nations of South America, is that part of the country, especially the Maldonado region, is influenced by the Atlantic Ocean. Penguins can also sometimes be seen on the beaches in Maldonado. In some respects, Maldonado can resemble parts of Spanish Galicia, which may explain why Albariño may do very well in that part of Uruguay. Only three wines from Bodega Garzón are currently imported into Massachusetts by Carolina Wine & Spirits, including a Sauvignon Blanc, Albariño and Tannat (priced around $15-$20). I tasted previous vintages of the Sauvignon Blanc and Albariño and enjoyed them, so was pleased to taste different vintages, and see how they paired with food. The 2013 Sauvignon Blanc was bright and crisp, with summery tastes of citrus and grapefruit. There were not any grassy notes, and it was more on the leaner side, an excellent wine for seafood or a warm summer day. Nicely balanced, it had plenty of character for the price, and should appeal to many consumers. I was even more impressed with the 2014 Albariño, and Garzón is one of only two producers of this grape in Uruguay. It spends all of its time in stainless steel and has some aging on the lees. It had excellent acidity, with bright citrus flavors and hints of tropical fruits as well. The longer it sat in the glass, it began acquiring more of a creaminess to the body, due to its lees aging. You would be hard pressed not to think this was a Spanish Albariño. With a creamy Lobster Bisque, it paired well, the acidity cutting through the creamy fat of the bisque. Highly recommended. With a Tannat, you might readily choose to pair it with a steak, which is always a fine choice. However, I decided to try some seafood, the Sushi-Grade Sesame Seared Tuna with Gingered Rice (pictured above). The 2013 Tannat is produced with a little Petit Verdot, Cabernet Franc, Marselan, and Caladoc. It is aged in large oak barrels for about 18 months, using larger barrels as they want to show more of the fruit of the Tannat. It is a muscular wine, one of power, yet there is still restraint and the wine isn't overly tannic or unwieldy. It is under control, presenting with delicious ripe plum and black cherry flavors, and hints of spicy undertones. The fruit dominates but it isn't a one-note wine, with more complexity than you might expect for a wine of this price point. It went very well with the seared tuna, the richness of the raw fish harmonizing well with the power of the Tannat. Highly recommended. Check out the wines of Bodega Garzón at your local wine shop, or ask your shop owner to order them for you. And seek out other wines from Uruguay too. The use of the term "Champagne" is legally limited, under international agreements, primarily to sparkling wine produced in the Champagne region of France. Back in March 2006, the U.S. and European Community signed wine accords where the U.S.agreed not to use certain European wine terms, from Champagne to Port, to protect the geographical origins and reputation of these wines. However, the agreement also allowed existing U.S. wine labels to be grandfathered in, continuing to allow them to use the protected terms. As such, you still can find wines produced in the U.S. and labeled as "California Champagme." According to The Japan Times, Japan is considering the idea of securing international protection for Sake, their traditional, rice based alcohol. The article states: "The National Tax Agency proposed Thursday that only sake made in Japan using domestically grown rice be sold as “Japanese sake.” At this time, there isn't a clear definition of "Sake" but the tax agency plans to create one by the end of the year. The Japan News also noted that the definition may include that "..sake made from rice grown in foreign countries or produced abroad cannot be sold as Japanese sake." As an aside, under that proposed definition of Japanese Sake, where the rice must be grown in Japan, that would mean at least a couples Sakes currently produced in Japan would fail to meet the definition. For example, Kikusui makes an organic Sake that is made from rice grown in the U.S., though the Sake is fermented in Japan. With the new definition, they could no longer refer to themselves as "Japanese Sake." It is still very early in this process so there are still many unknowns and we can only speculate as to what might come during the coming months. Nothing is set in stone. "Sake" is a Japanese term which refers to all types of alcohol, though it is commonly used in English to refer only to their traditional alcohol fermented from rice. The Japanese more often refer to that traditional rice alcohol as nihonshu, or Japanese alcohol, and legally, it is referred to as seishu, or clear alcohol. So which term or terms are they considering protecting? Sake, nihonshu or seishu? The news articles seem to all be using the term nihonshu, translating it as "Japanese Sake," though there isn't anything definitive yet. After further consideration, that could very well change. Legal protection apparently will be sought from the World Trade Organization (WTO), under Article 22 and Article 23, subject to any exceptions in Article 24. However, to try to gain legal protection for the term "Sake" might be difficult as the word itself is fairly generic, and it is not commonly used in Japan. They would have more ease in trying to protect nihonshu, Japanese Sake, but would that really gain them any advantage? The Sakes produced in breweries outside of Japan, including those in the U.S., usually use the term "Sake" by itself, without qualifying it as "Japanese." As such, protecting "Japanese Sake" would not prevent outside Sake breweries from doing anything they already do. The same would occur with protecting the term "seishu" as it isn't really used outside of Japan. Is there confusion in the market over Sake made in Japan and Sake made elsewhere? I can personally attest to witnessing such confusion, on multiple occasions, where people drank Sake made in the U.S. but thought it was made in Japan. As Sake in the U.S. remains a niche beverage, and ignorance about it remains high, it is easy to understand why people are confused. There is even a fair amount of people who are not even aware that Sake is made in the U.S. Interestingly, about 60% or so of the Sake consumed in the U.S. is actually produced in the U.S. Consumers need to learn more about Sake, including where it is produced. There might be a better way to protect Japanese Sake, and that would be to try to protect Sake categories such as Honjozo, Junmai, Ginjo and Daiginjo. Those terms have specific meanings in the Japanese Sake industry, and maybe those definitions could even be adjusted to only include Sake made from rice grown in Japan. Most, if not all, Sake breweries outside of Japan use these terms even though their use is not regulated in any way. For example, in Japan, a Ginjo Sake requires the rice to be polished down by at least 40%, but in the U.S. there is no legal definition of what constitutes a Ginjo. Because of that, a U.S. Sake brewery could technically label a Sake as a Ginjo even if the rice was only polished down by 30%. They are not legally bound by Japanese definitions, though I'm unaware of any U.S. brewery that actually doesn't follow their definitions. The possibility remains though and maybe that should be changed. The restriction of these terms might better indicate whether a Sake is from Japan or not. However, if Japan sought protection for those terms, it seems likely that pre-existing Sake breweries outside of Japan might be grandfathered in, allowing them to still use those protected terms. That will all depend on diplomatic negotiations. Only new breweries would likely be affected by any new restrictions. At this time, there are less than twenty Sake breweries in North America and only a few each in South America and Europe, There are also a small amount of Sake breweries in Australia and other Asian countries. As more and more Sake breweries are likely to be established outside of Japan, this might be a good time for Japan to seek legal protection. I'll be keeping an eye on Japan's progress in this area and will report back when I learn more. 1) Executive Chef/Partner Robert Sisca and Head Sommelier Todd Lipman of Bistro du Midi present the first month of the three-part Summer Rosé Tour, running now through August. While Rosé wines are enjoyed year round, they are most prominently celebrated in the summer months. To embrace the ever-growing popularity of this wine, Bistro du Midi is presenting the 2015 Summer Rosé Tour. Head Sommelier Todd Lipman has compiled an assortment of intriguing selections to be offered in multiple formats. These wines pair beautifully with Chef Robert Sisca’s featured dish of the month, highlighting the remarkable flavors of Provençe. 2) Bread & Salt Hospitality recently announced their first permanent restaurant, Juliet, opening in Somerville's Union Square, and for the past couple of weeks have been running a Kickstarter campaign to help make this vision a reality. As the campaign comes to a close, Bread & Salt invites you to join them for a special celebration at Cuisine en Locale on Saturday, June 13 from 7pm-10pm. Enjoy food inspired by Josh & Katrina's recent trip to Seville and Barcelona, hear more about their plans & progress, and be among the first to learn of some exciting news for the near future. Tickets ($25) include food and one complimentary entry into the Juliet raffle (dinner for four in the restaurant once open). Guests can also contribute further to the Kickstarter campaign and choose from a variety of experiences curated by Bread & Salt Hospitality and their friends, including: breakfast and/or dinner at Juliet, a catered dinner for ten in your home, the chance to be lobsterman for a day out on the boat with Snappy Lobster, and more! Beverages available for purchase from cash bar. 3) While every culture celebrates the coming of the summer solstice in their own way, in countries such as Sweden, Finland and Estonia, “Midsummer's Eve” is considered one of the greatest festivals of the year-- rivaling Christmas and New Year’s Eve. The celebration of the summer solstice predates Christianity and is celebrated with food, libations, activities and games including the traditional dance around the maypole. 4) TAMO Bistro & Bar at the Seaport Hotel will be hosting a special Glenlivet Dinner on June 23, from 6pm-9pm, for whiskey lovers, featuring a four-course dinner and scotch pairings by Seaport Chef Robert Tobin. Peter Karras, Master of Scotch, and Pernod Ricard will be on-hand throughout the intimate dinner to discuss the various forms of scotch being served and their nuances. The dinner will be preceded by a cocktail reception from 6:00pm-7:00pm. 5) June 18th marks “International Sushi Day,” a day to show one’s appreciation for the Japanese cuisine worldwide. Here are a few local restaurants helping to celebrate. Haru has 12 specialty Maki rolls including the Super Dynamite Roll (tempura-style tuna, freshwater eel and asparagus roll with sriracha, spicy mayo and eel sauces - $13.75), Back Bay Roll (edible 24K gold leaf, mango, avocado, tempura flakes and spicy red and white tuna - $18; pictured below, left), Lobster Roll (lobster, Boston lettuce, spicy mayo, avocado, cucumber, mango and tobiko - $16), Boston unCommon Roll (crunchy spicy salmon, tuna, avocado, mango, black tobiko and edible 24K gold leaf - $18; pictured below, center), Dragon Roll (eel and avocado wrapped around kani and cucumber - $17.75), Perfect Fantasy Roll (avocado-wrapped shrimp tempura and asparagus with spicy mayo ($13.50) and the Strawberry Fin Roll (crunchy spicy yellowtail, jalapeño peppers and mango topped with scallops, wasabi tobiko and fresh strawberries - $16.75; pictured below, right). As a seasonal specialty item available through July 6, Haru has a roll featuring the best from land and sea: Oscar Roll (beef tataki, snow crab, asparagus, lemon dressing - $18). Legal Harborside serves up variety of sushi including these specialty maki such as Harborside Tempura Lobster Roll (avocado, lobster, tobiko, spicy mayo and teriyaki – MP), Orange Dragon Roll (spicy salmon roll topped with salmon - $12.50), Caterpillar Roll (eel roll topped with avocado and teriyaki - $13.95) and the Hawaiian Roll (spicy tuna roll with salmon and avocado on top - $12.50). TAMO Bistro & Bar provides some intriguing Maki rolls such as the Vegetable Rainbow Roll (mozzarella, balsamic, cucumber, avocado, tomato, zucchini, carrot, squash - $10), Volcano Roll (baked scallop, crab meat, tobiko, avocado, cucumber, toasted sesame - $15), Spicy Tuna Roll (raw tuna, Dynamite sauce and tempura flour crunch set on an inside out cucumber & avocado roll, garnished with potato sticks - $13) and Seared Salmon Toro Roll (inside out cucumber & avocado roll garnished with pineapple sauce - $13). 6) On June 28 & 29, Legal Oysteria will host Italian brunch and lunch services to benefit the local community of Charlestown. Beneficiaries of the fundraiser include the Monument Square Neighborhood Association and the Friends of the Training Field. With the purchase of a $10 ticket, that is donated directly to the featured organizations, guests will receive a $10 dining credit redeemable on June 28 during brunch service or June 29 during lunch service. Additionally, guests will receive a $10 dining voucher redeemable on a future visit. Legal Oysteria’s brunch highlights with an Italian flare include the Stuffed French Toast (cannoli cream, strawberries, maple syrup - $7); Breakfast Pizza (bacon, scrambled eggs, mozzarella $11); Baked Eggs in Tomato Sauce (chickpeas and fontina, whole wheat olive toast - $8); and, Sopressata & Fontina Omelet (homefries, whole wheat olive toast - $11). For lunch, favorites include the Crispy Fried Calamari (salsa rossa - $10); Charred Octopus (tomato, potato, coriander vinaigrette - $10); Roasted Calm Pizza (garlic, oregano, mozzarella, pecorino - $11); Linguini and Clams ($17); and, Baked Oyster (shrimp, pancetta, mushroom - $4). Advance tickets are required. To reserve tickets, please visit: http://www.legalseafoods.com/index.cfm/page/Benefit-BrunchLunch,-June-28-29/cdid/45857/pid/43564. 7) Ward 8 is now offering Lobster Clambakes every Sunday evening, starting at 5pm for $33 per person. Ward 8 Executive Chef Kenny Schweizer has created a version of the New England summertime favorite: the lobster clambake. Included in the individual Lobster Clambake will be clams, corn on the cob, mussels, lobster, and chorizo sausage. Bar Manager Mike Wyatt will offer a New England beer pairing for an additional $8 with the clambake. Reservations are suggested but not necessary. All reservations can be made via phone at 617-823-4478. It can be paired with appetizers, entrees and dessert. It works well with a myriad of cuisines from Italian to French, Mexican to Spanish. It is an excellent accompaniment to a diverse selection of foods, from burgers to pizza, seafood to poultry, mushrooms to cheese. Its versatility is without question yet few restaurants, except for Asian spots, take advantage. I'm talking about Sake, that wondrous Japanese alcohol made from rice, which is unfortunately neglected by most non-Asian restaurants. I've previously written about how well Sake pairs with food, in articles such as The Science Of Sake & Food Pairings, Pairing Cheese & Sake, and Sake For Thanksgiving. I've presided at Sake dinners, pairing it with Italian cuisine at Prezza and French cuisine at AKA Bistro. Despite these inroads, Sake is still scarce on the menus of non-Asian restaurants in the Boston area. You're extremely lucky if you can even find a single Sake on such menus. Last December, in my year-end Favorite Restaurants post, I noted that my Most Anticipated Restaurant Opening was the Tasting Counter, owned by Chef Peter Ungár. As I said then, Chef Ungár "is a highly skilled chef, who I believe is one of the best in this area, and has remained beneath the radar for many diners in the Boston area." The Tasting Counter will be opening soon, offering a twelve course tasting menu, with ten drink pairings. I've seen the initial menu and it should be an exceptional meal. In addition, the Tasting Counter will also have the largest Sake menu of any non-Asian restaurant in the Boston area! That is quite an accomplishment, one showing a passion for Sake and confidence in its ability to pair well with a variety of dishes. With the tasting menu, you will have the option of pairing it with 10 different Sakes, from Sparkling Sake to Nigori, Honjozo to Junmai. The Sake list will change over time, offering new experiences with the various dishes. When is the last time you tasted ten different Sakes? When is the last time you drank Sake with a non-Asian meal? Many people have probably never had either of those two experiences so the Tasting Counter is offering something unique. At the Tasting Counter, you can opt for a wine or beer pairing, but you also can choose to expand your horizons with a Sake pairing. Recently, Chef Ungár retained my services to create the Sake program for his new restaurant, and we worked together to put together an initial list of 10 Sakes, obtained from Classic Wine Imports and Ruby Wines..The Sakes are generally from small, artisan breweries, and include Sakes which may be organic, made from heirloom rice, use traditional production methods, and more. The list is diverse, showcasing a wide range of Sake types and styles. It will be an excellent introduction to Sake for any diner, and the pairings will expand your palate and mind. The change needs to continue. We need more non-Asian restaurants to place Sake on their menus. They need to understand that Sake can pair well with any cuisine, and it may even pair better than wine with different foods. Sake is still a niche beverage and to help it become more mainstream, it needs to be available at more non-Asian restaurants. Most consumers think Sake is only for Asian food, but that misconception needs to change and restaurants can help destroy this myth by adding Sake to their menus. Let's hope that the Tasting Counter is but the first of many restaurants to take this great leap forward by showcasing Sake. If your restaurant is interested in adding a Sake program, feel free to contact me and I can assist you with that endeavor. Rant: Restaurant Reviews Ignoring Deadly Service? There's an aspect of restaurant service with the potential to kill millions of people. Despite its importance, almost no restaurant review addresses this issue. Why not? Shouldn't a review discuss such a vital element? How can we better protect those millions of people who are at risk? Recently on Facebook, Jacqueline Church raised an intriguing question: "Can/should a restaurant be "top" if they get a potentially life-threatening thing like food allergen handling wrong AND dismiss it cavalierly?" Jacqueline has food allergies, along with about 15 million people, so this is a matter absolutely vital to her health. She has written numerous articles about food allergies, and also trains restaurants in allergy awareness and handling. Her question made me ponder the issue, and realize my own restaurant reviews fail to address this issue. It is rare to see any restaurant review which addresses whether a restaurant properly handles food allergies or not. About the only time that happens is when the reviewer has food allergies so is particularly aware of that issue. How a restaurant handles allergy issues is an important aspect of service, yet it is part of service that has largely been ignored so far by most restaurant reviewers. To answer Jacqueline;'s question, I don't believe a restaurant can be considered one of the "top" or "best" if it screws up allergy handling. If that is the case, then we need to consider whether restaurant reviews should routinely address this issue or not. First, numerous restaurant reviews have length limitations so it can be a challenge to include absolutely every relevant issue. Is this an issue so important that it should be included? Second, how many reviewers properly understand the issue of allergies and can accurately assess the situation at a restaurant? I'm willing to bet that many reviewers fail to grasp the complete situation and could use some education in this regard. Third, if most restaurant reviews ignore the issue of food allergies, where can people go for that information? Though it would be beneficial for most restaurant reviews to address this issue, maybe a matter of such vital importance, a potential life threatening matter, would be better served by a different forum. Would you want to rely upon a single line in a published restaurant review mentioning that the restaurant handles allergies well? Or would you prefer a more detailed explanation of how the restaurant addressed food allergies? I think the latter would be far more useful. Maybe a better solution would be to have a website dedicated to reviews of how restaurants handle food allergies. It would be better to have knowledgeable individuals discuss the specifics, to provide the necessary details for those at risk. There have been a few articles, published over the last few years, providing lists of restaurants which best handle food allergies, but I'm unaware of any central website that reviews Boston area restaurants about these matters. It would be great to see more articles in the future too, but there is still a need for such a central website. 1) Boston’s Taste of the Nation for No Kid Hungry, a Culinary Event for a Cause, returns on June 9. A number of Boston area’s chefs, restaurateurs and mixologists will join forces to help end childhood hunger. Share Our Strength Founder and CEO Billy Shore; Taste of the Nation’s Distinguished Chef Council which includes: Gordon Hammersley, Tony Maws, Joanne Chang, Jodi Adams, Jason Santos, Andy Husbands, Michael Scelfo, Mary Dumont and Brian Poe. Some of this year’s participating restaurants include: Lincoln Tavern, Belly Wine Bar, Craigie on Main, Abby Lane, Tremont 647, Bistro du Midi, Bergamot, Alden and Harlow, Sweet Cheeks Q, Ribelle, Loyal Nine, TRADE, Tico, West Bridge, Davio’s, Grill 23, Harvest, 80 Thoreau and Fairstead Kitchen. Proceeds from the event benefit No Kid Hungry’s work to end childhood hunger in America. Led by a distinguished Chef Council, Boston’s culinary tastemakers will provide guests with bite-size fare, craft cocktails, and desserts of all kinds. One in five children in this country struggles with hunger, including more than 270,000 kids in MA. No Kid Hungry is ending childhood hunger in this nation by ensuring that kids start the day with a nutritious breakfast and families learn the skills they need to shop and cook on a budget. In 2014, Boston’s Taste of the Nation for No Kid Hungry raised $123,000 to help feed children in need more than 1,230,000 healthy meals. WHEN: Tuesday, June 9, from 7pm to 9:30p, VIP Admission starts at 6pm. COST: Tickets are $95 for General Admission and $150 for VIP admission. Tickets can be purchased by logging onto www.nokidhungry.org/boston. 2) Puritan & Company Wine Director, Peter Nelson, is changing things up a bit with a dine-around and sip-around event for the next Wine Wednesday which takes place on Wednesday, July 1st. Guests are invited to say “Yes Way, Rosé!” where they can mix, mingle and sample at this celebration of the pink-hued wines. Passed appetizers and small plates will be paired with a selection of 15 Rosé wines to make this event a little more special than most. This is a perfect way to taste a bunch of Rosé and find your favorites for the summer. Tickets are $65 and can be reserved by calling 617-615-6195 or logging onto www.picatic.com/roserumble. 3) Do you love cheese? And really, who doesn't? The American Cheese Society is holding Cheese Camp 2015 in Providence, Rhode Island, from Wednesday, July 29 to Saturday, August 1. This is a large educational conference and world-renowned cheese competition, and this is the first year in almost ten years that it has been held in New England. There is much for the cheese industry and food professionals but there are also events that will appeal to the general public. Check out the Festival of Cheese, which is open to the public on Saturday, August 1, from 7pm-9pm, and will feature over 1600 American artisan cheeses that were entered in the 2015 Judging and Competition. In addition to all of these cheeses, guests will also get to try a wide array of specialty accompaniments from preserves to chocolate to wine and craft beer. All guests will get a commemorative wine glass and cocktail plate. Tickets are $60 per person, with all proceeds going to the American Cheese Society’s cheesemaker scholarships. All of the remaining cheese will be sold at the Cheese Sale on Sunday morning from 9am-1 pm. Entry is free, and will be a great opportunity to purchase rare artisan cheeses from across the country at incredible prices. Individuals or groups can also volunteer from July 23 through August 2, 2015. Volunteers can assist with many aspects of ACS’s events, including but not limited to: volunteering with the renowned ACS Judging & Competition; assisting at the Conference registration desk; preparing cheeses for educational tasting sessions and sponsored events; and helping to set up the Festival of Cheese . Volunteers receive an official “ACS Cheese Camp Counselor” t-shirt, a ticket to the Festival of Cheese on Saturday, August 1 ($60 value), and any meals that coincide with their shift(s). Volunteers may purchase additional tickets to the Festival of Cheese at a discount. Shifts vary in length. Volunteers must be age 18 or older. Sign up to volunteer for ACS Cheese Camp 2015 in Providence at www.shiftboard.com/cheesesociety. For more information about volunteer opportunities, please contact Jeff Yeager at 720-328-2788 or jyeager@cheesesociety.org.